"According to published reports, the town was to receive more than $42,000 in Chapter 90 funds from the state's Highway Department to rebuild and resurface Main Street, from the Common south to the Greenwood School. To enable the work to be done at one time, the town 'put up' an additional $10,000 for the work, and the state agreed to give the 1949 and 1950 Chapter 90 fund allotments at one time. The project was estimated to cost $52,000. Work on the section from the Common to Water Street was done by S. Rotondi & Sons. The company used a 60-ton digger to rip up the old trolley car rails that were buried under the old macadam. After being ripped out of the old paving, the rails were piled on the side of the center excavation and removed by S. Casper & Sons, the 'junk dealers' who were awarded the $12 per ton bid. The works also included putting in granite capstones to cover a center drain that ran down the middle of Main Street, and the removal of two fire cisterns in front of the library and Lane's Drug Store. The cisterns were used to hold water for fighting fires before the town had its own water system. The broken macadam, gravel and old paving blocks were used to fill in the old skating rink at Hall's Park." - Text from calendar by Jayne M. D'Donofrio. 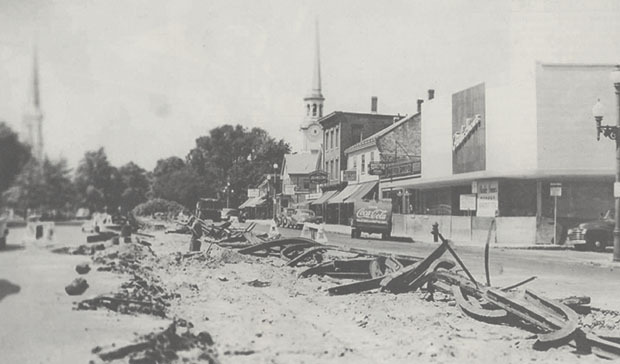 “Removing the street railway tracks, July 1949,” NOBLE Digital Heritage, accessed April 20, 2019, https://digitalheritage.noblenet.org/noble/items/show/7066.